Whether you are interested in socially responsible investing or you want to buy into a growth industry, a clean energy ETF can be a smart investment choice. Learn more about the clean energy sector and which funds are the best to buy now. What Are Clean Energy ETFs? Clean energy ETFs are exchange-traded funds that invest primarily in alternative energy sources, such as solar, wind, water, geothermal and nuclear. These alternative energy funds typically track the performance of an underlying index comprised of stocks of companies involved in clean and renewable energy sources. 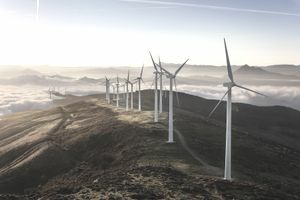 Top clean energy stocks in 2019 include wind and solar companies like NextEra Energy (NEE), TerraForm Power (TERP), FirstSolar (FSLR), and Brookfield Renewable Partners (BEP). Now may be one of the best times in history to invest in clean energy ETFs. According to Energy.Gov, the clean energy industry generates hundreds of billions in economic activity and has rapid growth potential in the coming year. With a combination of increasing interest in alternative energy resources and rising oil prices, stocks of clean energy companies could see significant growth in the long term. As for 2019, clean energy ETFs have solid momentum and appear to have the wind at their collective back. Most clean energy ETFs have put in double-digit gains, with some seeing price increases higher than 30% as the first quarter was coming to a close. However, investors are wise to keep a long-term outlook, because the alternative energy sector can see significant price volatility. In the past ten years, clean energy ETFs have average annualized returns that range from low single-digit gains to low single-digit declines. With that said, and considering that the clean energy sector is relatively new, this volatility can be expected in the coming years. Since most clean energy ETFs saw big declines in 2018, the year 2019 and the coming decade may show a rebound. Although clean energy ETFs share similar objectives and invest in many of the same sources of alternative energy, they do not all share the same holdings. Also, it is generally wise to buy ETFs that have a multi-year track record and high relative assets. Therefore, to determine which clean energy ETF is best, investors should analyze the details of how each fund invests before buying shares. Invesco Solar ETF (TAN): Investors wanting concentrated exposure to solar energy stocks and one of the largest clean energy ETFs on the market should take a look at TAN. This ETF tracks the MAC Global Solar Energy Index, which consists of about 25 solar energy stocks, including top holdings First Solar Inc (FSLR), SolarEdge Technologies (SEDG), and Canadian Solar, Inc (CSIQ). The expense ratio for TAN is 0.70% or $70 for every $10,000 invested. iShares Global Clean Energy (ICLN): This ETF tracks the S&P Global Clean Energy Index, which is composed of 30 clean and renewable energy stocks from all around the world. Top holdings include Companhia Energetica Minas Gerais (CIG), Siemens Gamesa Renewable Energy (SGRE), and Vestas Wind Systems (VWS). Expenses for ICLN are 0.47%. First Trust NASDAQ Clean Edge Green Energy Index (QCLN): Investors who want to focus on green energy technology companies involved in solar, biofuels, and advanced batteries. QCLN tracks the NASDAQ Clean Edge Green Energy Index, which consists of about 40 stocks, including top holdings ON Semiconductor Corporation (ON), Albemarle Corporation (ALB), and Tesla Inc (TSLA). Clean energy ETFs can be used wisely as a part of a broadly diversified portfolio. However, investors are cautioned not to allocate more than 5-10% of their assets to one concentrated sector. Furthermore, the clean energy sector may have a bright future but the industry has yet to find solid footing in the current economic and political environment. For this reason, market risk and price volatility will be higher than the broad market indices.